Your pancreas is an organ and gland that is located in your upper abdomen, near your stomach. The pancreas releases two important hormones, insulin and glucagon, as well as enzymes that help you break down and process food. Pancreatitis is an inflammation of the pancreas that may be short-lived or chronic. 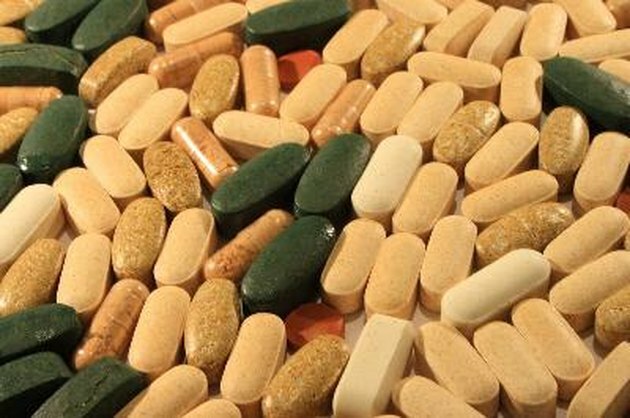 Vitamins, herbs and other dietary supplements may help treat pancreatitis. However, discuss the possible risks and benefits of supplementation with your doctor before using these substances. The most common symptom caused by pancreatitis is abdominal pain that is often extreme. If you have acute pancreatitis, your pancreas quickly becomes inflamed, although the inflammation is usually resolved within several days. If you have chronic pancreatitis, however, pancreas inflammation may last for prolonged periods, even years, which can cause irreversible damage in this organ. In some cases, chronic pancreatitis may manifest after repeated bouts of acute pancreatitis. Certified nutritional consultant Phyllis Balch, author of "Prescription for Nutritional Healing," notes that there are many vitamins, herbs and supplements that may help treat pancreatitis. Vitamins B3 and B5 are important for fat and carbohydrate metabolism; vitamin C is a powerful antioxidant; and vitamin E is important in tissue repair. Helpful herbs for this condition include milk thistle, red clover, burdock root, dandelion root, olive leaf, garlic and licorice. Important non-herbal supplements for the treatment of pancreatitis include chromium picolinate, calcium and magnesium and pancreatin. Dandelion root is an herbal supplement that is commonly used to help treat pancreatitis. Balch notes that dandelion root helps stimulate and strengthen your pancreas and may improve the function of other organs, too, including the kidneys, spleen and stomach. The root of the dandelion plant contains many phytochemicals and nutrients and is the part of the plant most often used in herbal preparations, although the leaves and flowers may also be used. Dandelion may help cleanse the blood and liver and increase bile production. Vitamins, herbs and other dietary supplements should only be used in treating pancreatitis after you have discussed the health benefits and risks with your family physician. A qualified health care professional can evaluate your condition and make other relevant treatment suggestions that may be more appropriate for you. Some dietary supplements may cause unintentional side effects or drug interactions that may be dangerous. Ask your doctor about proper dosage, treatment duration and other herb-related topics.